A beautiful 14K gold My Fire pendant, designed by Emuna, is the symbol of faith of the Breslov Hasidic Rabbi, Rav Nachman of Breslov. 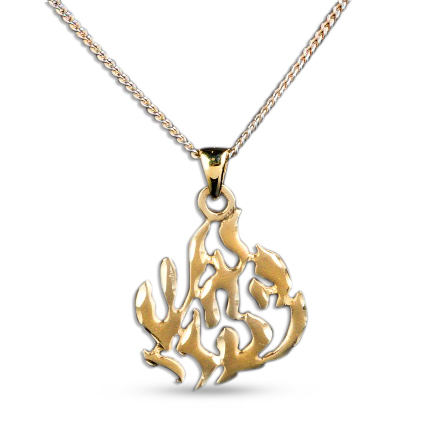 Emuna, one of Israel's top Israeli Jewelry designers, has designed this symbol of Rabbi Breslovs faith in G-d, My Fire, in an exquisite 14K gold pendant made with diamond cuts embedded down to the inscription. "My Fire will burn to the coming of the Messiah" the symbol of the Braslev Hassidic dynasty, founded by Rav Nachman of Breslov, carries the deep saying that my belief, my faith in G-d will never stop, never wane and never be extinguished until the Messiah comes. Rabbi Breslov taught his followers to live via three principles, faith, joy and simplicity. Three Israeli artists make up Emuna, in a studio in the hills near Jerusalem. Their specialty is designing jewish jewelry with links to faith - emuna, made with 14K gold, 18K gold and 925 silver.